Humble Chess Champion from Columbus, Ohio continues to lead by example! Diamond Shakoor, 11 year old Chess Genius from Columbus, Ohio makes history again in the Chess World! On Febuary 16, 2012, Diamond went 6-0 to win the Elementary District Chess Title for the 4th Consecutive Year! There were 42 Schools competing and 76 competitors playing for the Title! Diamond is in the 5th grade. Diamond is 24-0 in Columbus City Schools and attends Eastgate Elementary (Carol Wheat, Principal)! The Tournament has been held for 26 years and this is 1st Time for a repeat… four years in a row! Ms. Shakoor is also an accomplished singer! 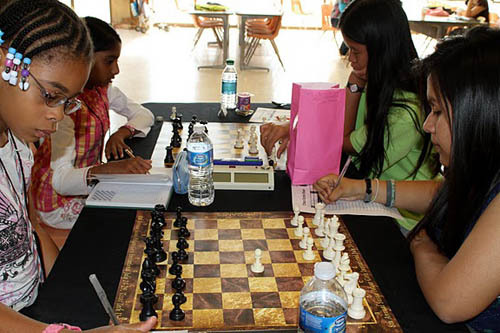 Diamond in action last year at Polgar Girls Invitational! Diamond now prepares for the All-City Honors Choir Presentation in Columbus on March 17, 2012. Diamond’s next major Chess Event is in Chicago in April 20-22, 2012; All Girls Chess Nationals! Thank you Ms. Sally! Peace and Blessings! Congrats to diamond for celebrating the 11th anniversary of chess drum. Thank you Ms. Elena! Peace and Blessings! Congrats! On this incredible accomplishment, Diamond. You have great talent. Continue to press forward in your musical talent as well. It was a honor to meet you and your Father in Ohio. It was exciting to see you in action. Both of my sons(Ronald and Jordan Best) were very impressed in your solid game play. We hope to see you in action again. Hi Mr. Wade! Tell Ronald and Jordan we said hi! Thank you for the words of wisdom! Your sons accomplishments also help to motivate me in chess and in life; and many others! Hope to see you all soon! Diamond , you go girl !! 🙂 Keep up the good work. You may even one day become a Grandmaster……. Very impressive Diamond!!! You are a true inspiration. A great feat! You are defintiley on my radar! I’m looking forward to great things.